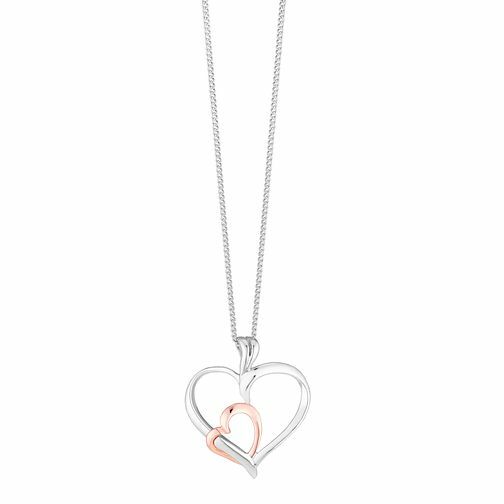 Featuring two delicate cut out heart charms in contrasting hues of sleek and classically elegant silver and 9ct rose gold, this charming pendant is a versatile accessory that instantly updates any outfit. A beautiful gift for someone special, this elegant piece is destined to become her staple accessory. Elegant gold jewellery for every occasion. Silver and 9ct rose gold heart pendant is rated 4.4 out of 5 by 7. Rated 5 out of 5 by Anonymous from Cute dainty necklace Perfect size for a smaller necklace, great quality for the price. Rated 5 out of 5 by Anonymous from Excellent quality I bought a rose gold heart necklace and it looks brilliant. Something that my girlfriend will love.